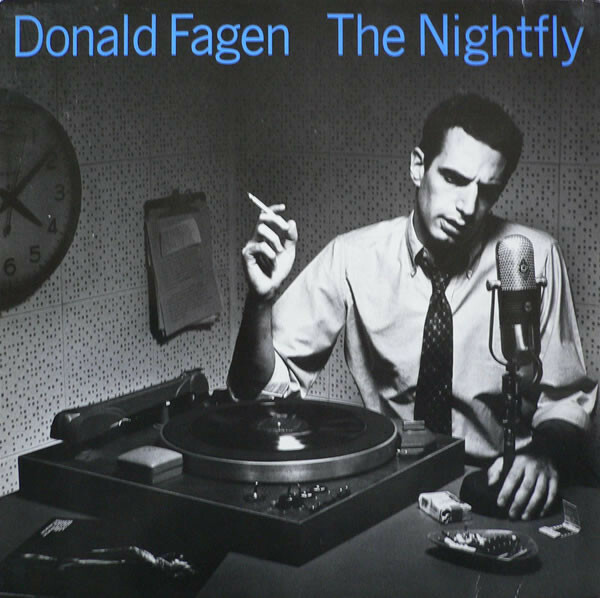 The Nightfly is the debut studio album by American singer-songwriter Donald Fagen. Produced by Gary Katz, it was released October 1, 1982 by Warner Bros. Records. Fagen was previously best known for his work in the group Steely Dan, with whom he enjoyed a successful career in the 1970s. The band separated in 1981, leading Fagen to pursue a solo career. Although The Nightfly includes a number of production staff and musicians who had played on Steely Dan records, it was Fagen’s first release without longtime collaborator Walter Becker. Unlike most of Fagen’s previous work, The Nightfly is almost blatantly autobiographical. Many of the songs relate to the cautiously optimistic mood of his suburban childhood in the late 1950s and early 1960s, and incorporate such topics as late-night jazz disc jockeys, fallout shelters, and tropical vacations. Recorded over eight months at various studios between New York City and Los Angeles, the album is an early example of a fully digital recording in popular music. The nascent technology, as well as the perfectionist nature of its engineers and musicians, made the album difficult to record. Charles Walter “Chuck” Rainey III (born June 17, 1940 in Cleveland, Ohio, United States) is an American bass guitarist who has performed and recorded with many well-known acts, including Aretha Franklin,Steely Dan, and Quincy Jones. According to Rainey’s website, he has performed on over 12,000 albums and nearly 150,000 songs. Rainey’s youthful pursuits included violin, piano and trumpet. Later, while attending Lane College in Tennessee, Rainey switched to baritone horn to join the school’s travelling brass ensemble. While on active militaryduty, Rainey learned rhythm guitar and began playing professionally with local bands. His lack of improvisational skills on guitar led him to pick up the bass, and soon Rainey found himself working steadily as a studio bassist in New York City, recording or touring with many of the greatest acts of that time. As a member of The King Curtis All-Stars, he toured with the Beatles on their second run across the United States. By the beginning of the 1970s, Rainey had firmly established his place as one of New York City’s first call session bass guitarists. Moving to Los Angeles in 1972, his work with Quincy Jones continued as a member of Jones’ big band, and Rainey continued to work as a studio musician on others albums like, Betty Davis’ famously shelved session from 1976 or Tim Buckley’s Greetings from L.A. About this time, he bumped into friend and Steely Dan producer Gary Katz, which led to performing on tracks for Pretzel Logic by Steely Dan. His relationship with Steely Dan continued through Katy Lied; The Royal Scam, Aja, where he performs on every track except “Deacon Blues” (Walter Becker played bass for that track); and Gaucho. Rainey’s style has always been to provide a rhythmic and melodic bottom that works with the drummer for the benefit of the song. His books on bass study refer to a “sensitivity to music” and a dedication to studying the fundamentals of music theory. While his “sideman” philosophy of bass has not brought him the level of recognition of star players such as Jaco Pastorius, Rainey is by far more recorded than his more famous contemporaries.